Enhancing Professional Development of Education Practitioners and Teaching/Learning practices Sarajevo, Bosnia and Herzegovina, 17-18 November 2006 Prospects. 2 1.0 The Prospects of Teacher Education in South-east Europe CEPS in co-operation with partners in South-east Europe just finished a research project which could offer some food for thought in todays discussions on teacher education at institutional, national and international levels. Results of the project (financed by OSI, SDC, Unesco) are now published in a book entitled The Prospects of Teacher Education in South-east Europe. The project aimed to develop an exhaustive study on how the systems of pre-service and in-service teacher education work in practice: - which plans for the (near) future have been developed at faculties, and - what acting teachers in schools think about the existing provision and what their real needs are in this area. 3 2.0 The Project In preparing the theoretical bases and methodological guidelines, the core project group relied on the outcomes of the most recent discussions at the European level. A special website has been developed with multilingual background documents in a virtual library and links. 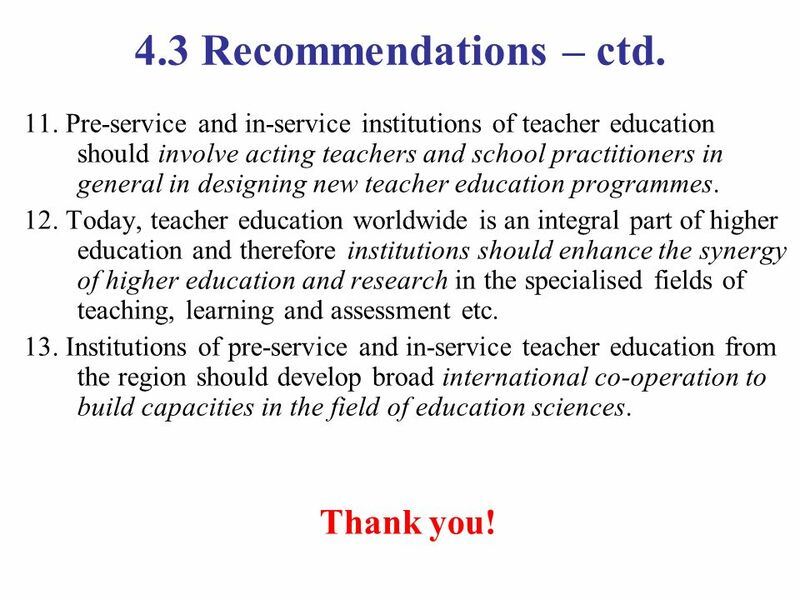 Institutions of teacher education and acting teachers from 12 countries were included in a survey. Their answers to two questionnaires provide a colourful picture of the state of affaires in teacher education and qualifications, open a variety of comparisons – and demand improvements on the national, institutional and school level. Our seminar is the first promotion of this book and aims at discussing these issues in a international group teachers and education practitioners. 4 3.0 Questionnaire A vs. B Questionnaire A was sent to institutions of TEd while Questionnaire B was sent to acting teachers. 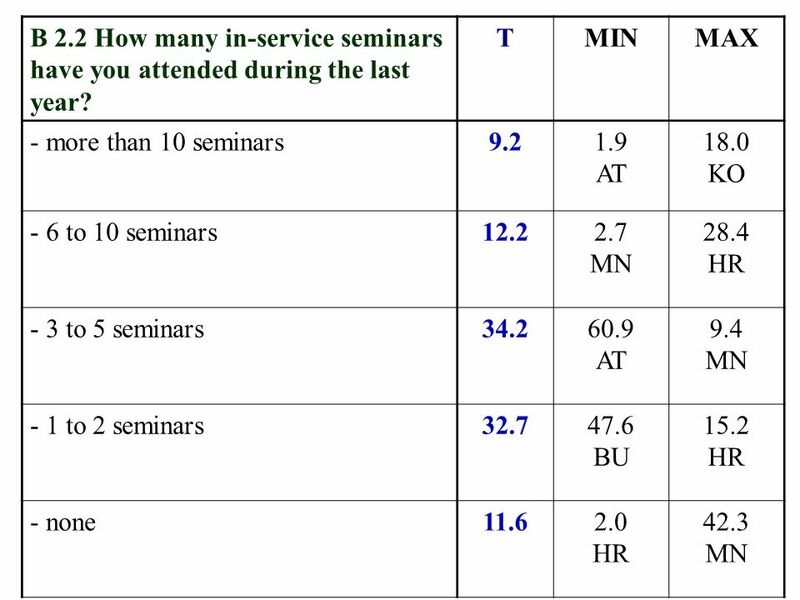 131 institutions of TEd (colleges and faculties as well as specialized in-service institutions) from 11 countries (Albania, Austria, Bosnia and Herzegovina, Bulgaria, Croatia, Kosovo, Macedonia, Moldavia, Montenegro Romania, Slovenia and Serbia) responded to the Q-A. 2290 acting teachers and other education practitioners from 12 countries (here, teachers from Austria joined the survey) responded the Q-B. 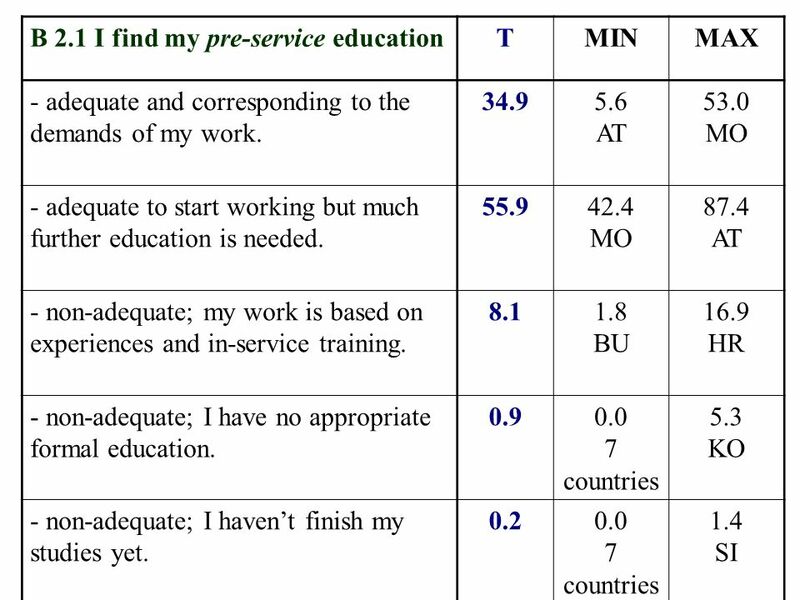 The project group (12 national teams) produced 12 reports of national systems of pre-service and in-service TEd; they also reflected responses to both questionnaires from national point of view. However, these results are very interesting again if observed from regional point of view. 8 4.1 Q-A:institutions at a glance – ctd. Questionnaire A consists of introductory and two core parts – (3) pre-service and (4) in-service. In the continuation, we focus only to findings in the area in-service teacher education. 10 A 4.8 What are the most frequently offered contents and topics in in-service teacher education? (Respondents had five choices and ranked options on a scale from 1 – most frequent – to 5). 2.02methods of teaching/learning/assessment 2.17particular teaching subjects 2.67development of skills for using ICT 2.80intercultural education, education for human rights 2.87school/educational management 3.04learning (mastering) a foreign language 3.17educational work with children with special needs 3.22co-operation with parents, the school environment etc. 3.32social and cultural aspects of education, ethics etc. 3.32development of general communication skills, rhetoric etc. 25 4. A view to the future: recommendations 1. 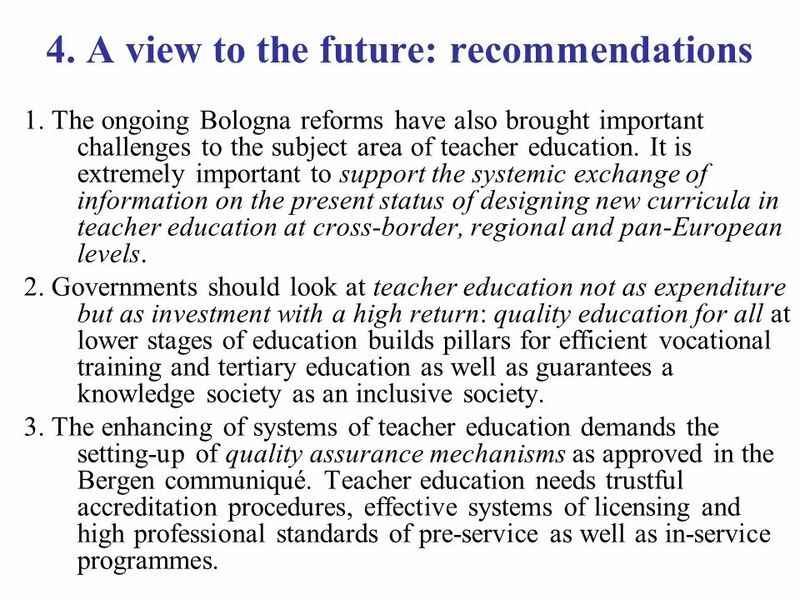 The ongoing Bologna reforms have also brought important challenges to the subject area of teacher education. It is extremely important to support the systemic exchange of information on the present status of designing new curricula in teacher education at cross-border, regional and pan-European levels. 2. Governments should look at teacher education not as expenditure but as investment with a high return: quality education for all at lower stages of education builds pillars for efficient vocational training and tertiary education as well as guarantees a knowledge society as an inclusive society. 3. The enhancing of systems of teacher education demands the setting-up of quality assurance mechanisms as approved in the Bergen communiqué. Teacher education needs trustful accreditation procedures, effective systems of licensing and high professional standards of pre-service as well as in-service programmes. 26 4.1 Recommendations – ctd. 4. 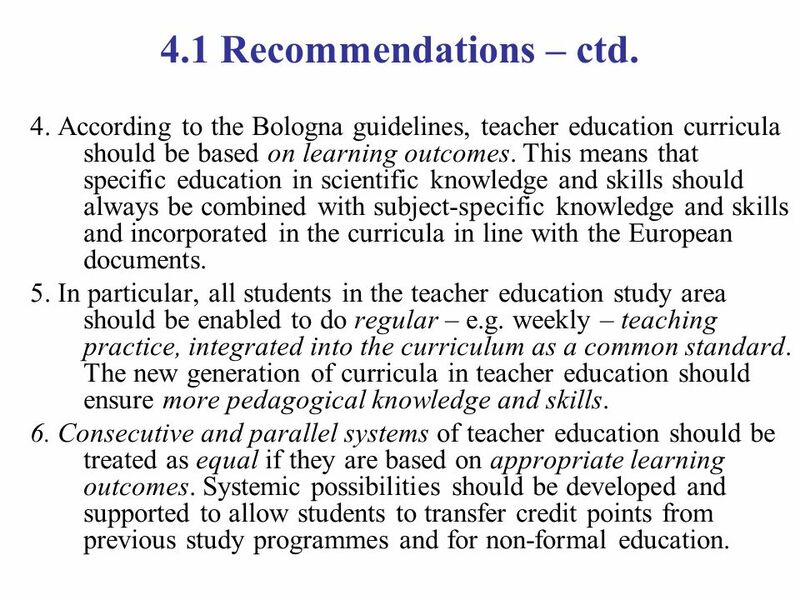 According to the Bologna guidelines, teacher education curricula should be based on learning outcomes. This means that specific education in scientific knowledge and skills should always be combined with subject-specific knowledge and skills and incorporated in the curricula in line with the European documents. 5. In particular, all students in the teacher education study area should be enabled to do regular – e.g. weekly – teaching practice, integrated into the curriculum as a common standard. The new generation of curricula in teacher education should ensure more pedagogical knowledge and skills. 6. Consecutive and parallel systems of teacher education should be treated as equal if they are based on appropriate learning outcomes. Systemic possibilities should be developed and supported to allow students to transfer credit points from previous study programmes and for non-formal education. 27 4.2 Recommendations – ctd. 7. 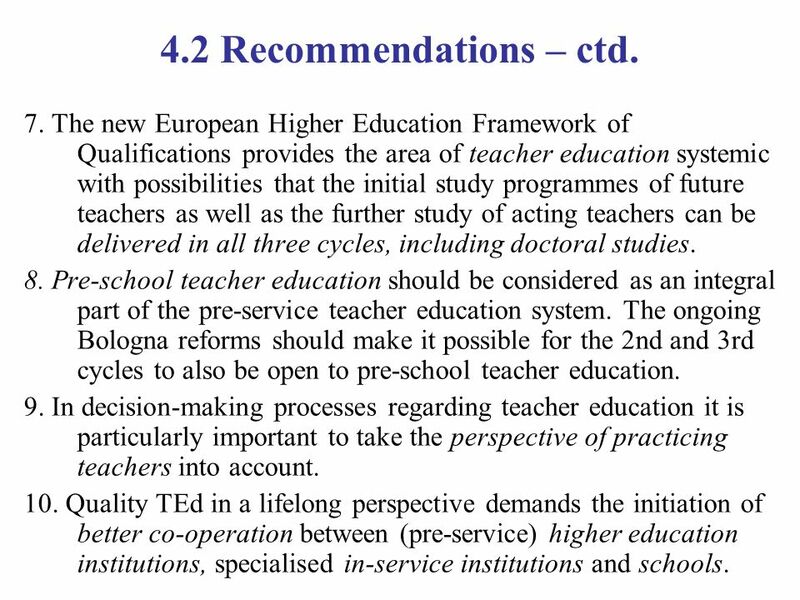 The new European Higher Education Framework of Qualifications provides the area of teacher education systemic with possibilities that the initial study programmes of future teachers as well as the further study of acting teachers can be delivered in all three cycles, including doctoral studies. 8. Pre-school teacher education should be considered as an integral part of the pre-service teacher education system. The ongoing Bologna reforms should make it possible for the 2nd and 3rd cycles to also be open to pre-school teacher education. 9. In decision-making processes regarding teacher education it is particularly important to take the perspective of practicing teachers into account. 10. Quality TEd in a lifelong perspective demands the initiation of better co-operation between (pre-service) higher education institutions, specialised in-service institutions and schools. 28 4.3 Recommendations – ctd. 11. Pre-service and in-service institutions of teacher education should involve acting teachers and school practitioners in general in designing new teacher education programmes. 12. Today, teacher education worldwide is an integral part of higher education and therefore institutions should enhance the synergy of higher education and research in the specialised fields of teaching, learning and assessment etc. 13. Institutions of pre-service and in-service teacher education from the region should develop broad international co-operation to build capacities in the field of education sciences. Thank you! Download ppt "Enhancing Professional Development of Education Practitioners and Teaching/Learning practices Sarajevo, Bosnia and Herzegovina, 17-18 November 2006 Prospects." 1 MODEL FOR IN-SERVICE TEACHER TRAINING AND PROFESIONAL DEVELOPMENT EXPERT SEMINAR ON TEACHER TRAINING GRAZ November 2003 Snezana Klasnja Ministry of Education. Enhancing Professional Development of Education Practitioners and Teaching/Learning practices Sarajevo, Bosnia and Herzegovina, November 2006 The.